Does not come with cushion or sleeping pad. You need to purchase one to promote your camping experience. Going camping involves many physical activities. Therefore, having a camping cot to help you relax when you need to reenergize is quite important. Consequently, the Coleman Converta Camping Cot offers you the best camp cot for your comfort. It is a good cot for camping due to its sturdiness. The cot does not curve in when you sleep on it as it is made from durable fabric, thus giving you a wonderful time of rest. Additionally, the cot can be used in four different reclining positions, hence improving your flexibility. You can use the camping cot in an upright position and continue adjusting it up to a full recline position going by your preference. Moreover, the sturdiness of the cot makes it a durable item, thus giving you the benefit of not purchasing a camping cot every time you go camping. Apart from camping sites, the cot can also be used in other areas such as the poolside. The Coleman Converta cot can also be used as a gently reclining chair, hence making it the ideal cot for various functions. It is also rust resistant and can be adjusted to any level that you want as it can go flat when you need to sleep comfortably on the ground. It comes with a one-year limited warranty when you purchase it. It will be replaced in case of breakdown due to manufacturing defects. In conclusion, the Coleman Converta cot can be put to a number of uses like camping, when swimming or when relaxing in your backyard. It is a sturdy cot that can easily be folded for storage. 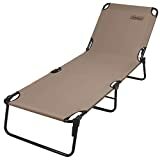 Moreover, it offers ample space and flexible resting positions. Do not hesitate to buy this camping cot especially if you are light of weight.